Notch's latest creation is a high score-centric zombie shooter made in Unity. The 7DFPS game jam has come to an end and among the creations to come out of it is Shambles, a zombie-centric shooter developed by Markus "Notch" Persson of Minecraft fame. Built with Unity, Shambles gives players a gun, some bullets and some health and then tosses them into a zombie apocalypse where things work a bit differently than you might expect. 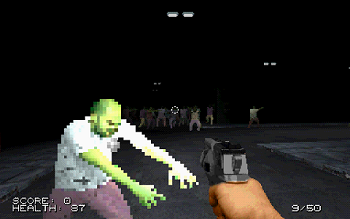 While you do participate in tried and tested activities like shooting the undead, the game was designed so that players will often be forced to turn the gun on civilians and soldiers as well. Civilians, you see, drop health packs when they die, while shooting soldiers, who also shoot zombies themselves, can yield a new weapon that could be an improvement over the one currently in your hands. Zombies, in turn, will drop yellow orbs that increase your score. Seeing as the object of the game is to earn a high score in addition to simple survival, you're going to want to be grabbing those too. Zombies can also infect civilians and soldiers, giving you all the more reason to be less discerning with your targets. All in all, Shambles presents an interesting balancing act as you kill zombies while also presumably trying to limit your murder of fellow humans. Fast-paced and generally short lived; a game of Shambles isn't going to have the longevity of something like Minecraft. That said, it's still a lot of fun and it's always interesting to see what a high profile developer like Notch will do outside of the tropes and titles we associate them with. Players interested in giving it a try can download a version here, or a play it in their browser.